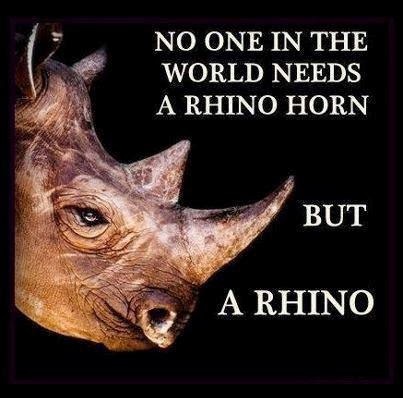 A recent resurgence in rhino poaching is due most likely to the equally untrue rumors that a) the horn powder cures cancer, and b) it boosts virility (together with its amazing anti-hangover ability makes it a great party drug!). 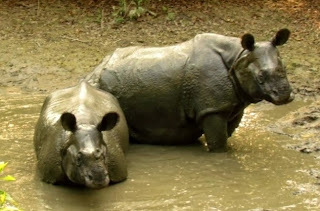 Three of 5 rhino species are critically endangered, including the Javan rhino, the world's rarest land mammal. This species has been wiped out except for one tiny group of ~40 individuals in a single park on Java, in Indonesia. What's crazy is that rhino horns are made of keratin, just like our hair and fingernails, so really these people could just bite their nails and chew on their hair for free instead of paying up to US$1,400 per ounce for rhino horn powder, and they'd get the same benefits. 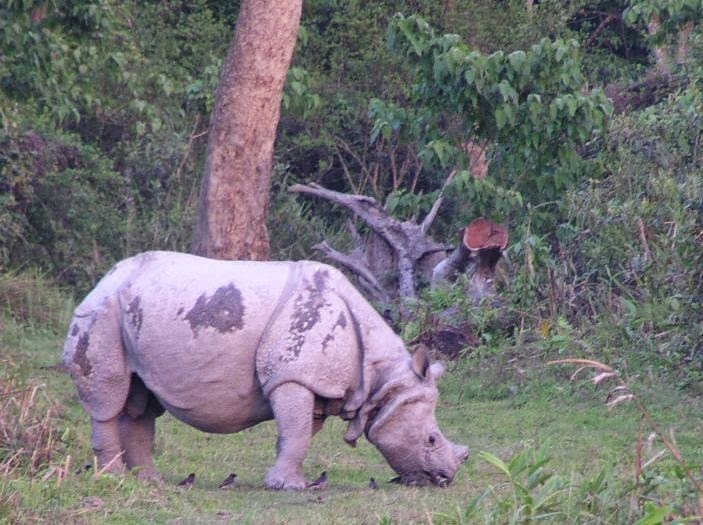 Aside from humans slaughtering them to the point of extinction for unproven medical benefits and social status, rhinos are quite biologically fit. Rhinos are herbivores - they eat the leafy parts of plants. And plants, as we know, are found nearly everywhere. They either graze on grasses or browse on bushes, and they have a prehensile (adapted for grabbing) upper lip that lets them grab onto leaves and branches, which makes for efficient nibbling. They are generally peaceful but have several weapons that have helped them survive the last 50 million years. First and most obvious, rhinos are huge and strong, so adults have no natural predators (tigers or lions can kill a young rhino). Rhinos can run up to 30 - 40 mph (48-64 kph). You've been warned. They wear skin that is tough and over a half inch (1.5 cm) thick to protect them from thorns, predator teeth, and the horns or teeth of other rhinos. And, of course, they have those horns, which they use mainly to defend against attackers, including other rhinos. Females will use their horns to both guide their calves and protect them from predators, while males will fight to defend territories and show their dominance. They can also dig for water and break branches with their horns. Be grateful for opposable thumbs! 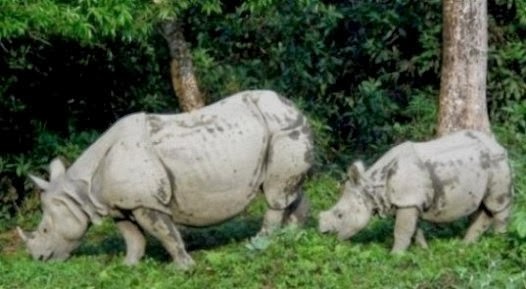 Rhinos can survive without horns -- female Javan rhinos have stubs or minimal horns, and in some African parks, rangers de-horn rhinos to discourage poaching, though this may undermine the ability of the de-horned bull to retain prime territory. In fact, two of the Asian rhino species with sharp incisor teeth use them, instead of their horns, to slash at and defend against their attacker. In Return of the Unicorn (see below), Eric Dinerstein highlights the importance of large, sharp lower incisors in male rhinos to maintain their territories and access to the ladies. 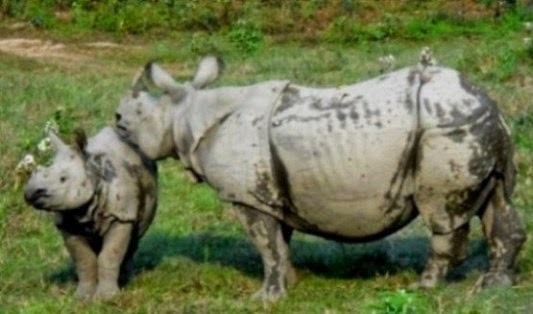 A group of rhinos is called a crash. This is what they do to you if you try to count them. Rhinos are most closely related to other odd-toed ungulates (hoofed animals) called perissodactyls, including tapirs, horses, and zebras. Rhino skin looks tough and durable but is actually sensitive to sun and insect bites - they cover themselves with mud and are normally active at night to keep from getting burned. How do you know when a rhino's about to charge? He takes out his credit card. What should you do if a rhino charges you? Pay him! The International Rhino Foundation works to both celebrate and conserve rhinos - the site has loads of info on rhinos and how we can help them survive for another 50 million years. The Rhino Resource Center site has even more info, including rhino images and the latest scientific studies. To learn more about Indian, or Greater One-horned, rhinos and the efforts of scientists to study and conserve them in Nepal, have a look at the book Return of the Unicorns by Dr. Eric Dinerstein of World Wildlife Fund.